Remember the 15 second commercial run on television for the Bloomington Public Library? The FOIA response claims two television commercials were produced. I only received one in response to my FOIA request. have run have not been billed. Posted in BloNo, Bloomington, Local, Renner, Taxes.Tagged advertsing, Bloomington Public Library, TV commercials. 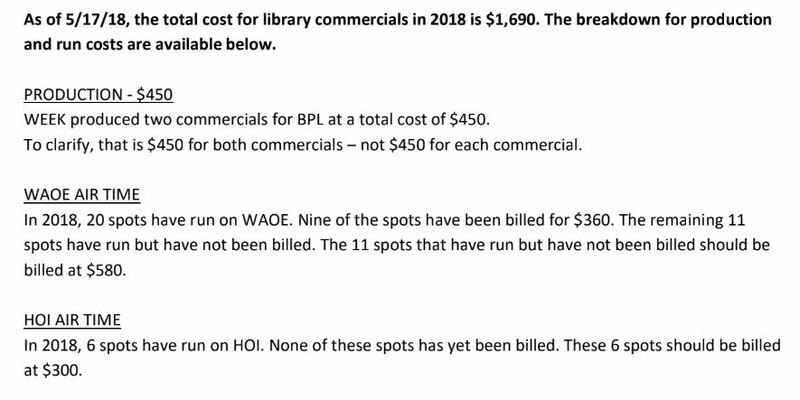 So, the City is using old, overpriced advertising methods (TV ads) to attract visitors to an antiquated method for consuming knowledge (library). Makes sense. Who here watches TV commercials? Probably all those millennials and young people. Haha! People just fast-forward the show that they DVR, which they’re watching on their own time. The City lives in the Stone Age. I thought TV costs a lot more than they paid, but then it’s only 15 seconds. It’s also not being aired during the Super Bowl. Library cards and those 600 other programs are NOT FREE! They are paid for by taxpayer dollars. Everything that centers around the library from the turing on the lights to emptying the garbage is paid for by the taxpayers! Previous Post What’s vacant downtown?